As the start of this summer movie season shows, some movie franchises never die; they just start over. This summer brings new versions of "X-Men," "Terminator" and "Star Trek" _ each revitalized with a tested Tinseltown technique: the origin story. "Ultimately, the hook of Hollywood has always been to make (franchise films) the same but different _ just different enough that you have to go back to the movie theater," said David Poland, editor of MovieCityNews.com. "With an origin story, they can go back to the beginning and start again." So the latest "X-Men" movie shows how Wolverine developed from a sickly kid into an indestructible superhero with killer claws. "Star Trek" brings viewers into a universe where Capt. James Kirk and Spock are young Starfleet soldiers just beginning to become leaders and friends. "Terminator Salvation" introduces fans to a John Connor who has yet to become the leader of the resistance movement against the machines. Filmmakers say all were intentional re-imaginings of the beloved franchises made to please past fans and generate new ones. And history says it works. The James Bond franchise got new life when it introduced Daniel Craig in 2006's "Casino Royale" as an unpolished hero who had yet to become like the suave, unshakable Bond. The film and its follow-up, "Quantum of Solace," each grossed more than $168 million. "Star Wars" rebooted itself 16 years after the first trilogy wrapped. Fans already knew Luke Skywalker's story, so the three prequel films that followed told the origins of the villain, Darth Vader. The first, 1999's "Star Wars: Episode I _ The Phantom Menace," took in more than $431 million. The two following films, 2002's "Attack of the Clones" and 2005's "Revenge of the Sith," collected $310 million and $380 million, respectively. Batman began anew when Christopher Nolan took in 2005 with "Batman Begins." The film was a dark departure from Joel Schumacher's campy take in 1995's "Batman Forever." 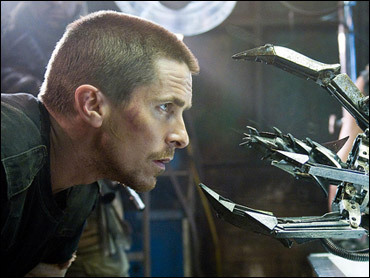 Nolan introduced Christian Bale as a conflicted man who becomes a crime fighter as a way of battling his own inner demons. It generated more than $205 million in domestic ticket sales and set the stage for last summer's uber-blockbuster, "The Dark Knight," the highest-grossing film of 2008 with $531 million. "The dream is that once you reboot these things, the next movie will become a cash cow," Poland said. "Terminator Salvation" director McG said he's plotted out two more movies in hopes that his franchise reboot is successful. "I do indeed have the story shape for movies two and three," he said. "We have to see how this film does to see if that's warranted or not." Rebooting franchises is good for studios, which benefit from a built-in audience and marketing hook. It's good for filmmakers, who can take advantage of advances in technology for more spectacular special effects that the original films had. And it's often good for fans _ though, not always. The fourth "Indiana Jones" movie, which introduced new characters and aimed to revitalize the franchise nearly 20 years after the original trilogy was completed, drew criticism from fans and was skewered by the kids of "South Park." The fourth film in the "X-Men" franchise, "X-Men Origins: Wolverine" also generated mixed reviews _ only 37 percent of them positive, according to RottenTomatoes.com, which aggregates movie reviews from newspapers and Web sites and assigns a percentage-based score to each flick. The film, which centers on how Logan becomes Wolverine, was designed to help the franchise "start fresh" with the claw-wielding character at its core, said director Gavin Hood. "I'm very respectful of the franchise and ... if anything, a little intimidated to hope we measure up to the expectations of people who love (it)," he said. "Because it's a prequel, it's almost like we're starting over and we get to explore this character who's only been part of an ensemble cast until now." "Star Trek," directed by J.J. Abrams, introduces new faces as familiar characters, with Chris Pine playing Capt. Kirk and Zachary Quinto as Spock. It places them in an alternate reality that shares some, but not all, details from the original TV series and movies. Aimed at satisfying hard-core fans while attracting new ones, the film has an overwhelmingly positive score on RottenTomatoes _ 95 percent. Abrams maintained some elements _ the shape of the starship Enterprise, the circular design of the bridge, the general design of the costumes. But even those underwent updates, from subtle to drastic, while the story and character relationships are huge departures from the "Trek" of old. "That's part of owning `Star Trek,' if we're going to make this movie our own," he said. "If we're just constantly looking over our shoulders hoping we're not insulting some design aesthetic from almost half a century ago, we're never going to have the freedom to make a creative choice." Fans of the "Terminator" franchise can see if its reboot was successful once the film opens Wednesday. The film stars Christian Bale as John Connor and Sam Worthington as a mysterious new character, Marcus Wright, who find themselves in a changed world after Judgment Day _ perpetrated by Skynet's machines _ destroyed most life on Earth. Bale initially passed on the role, but then he saw that the franchise was worth mining for fresh material. "It's a re-imagining in the placement, being further into the future _ a world which we hadn't seen before in this mythology," he said. "There's a nice opportunity to really bring it full circle with any potential future movies." Rebooting time-tested franchises is often a bet worth taking. Just look at Broadway, Poland said. "The musicals are all revivals, so you go into the show humming the score," he said. "People go into these movies knowing the characters and having that degree of familiarity with the story."